Home announcements Apple iPhones Special Offers Rumored iPhone Trade-In Program Has Officially Started! Rumored iPhone Trade-In Program Has Officially Started! 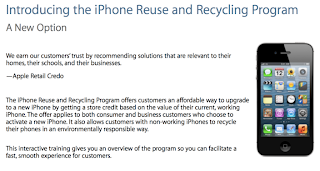 The speculated iPhone trade-in program, also referred as “iPhone Reuse and Recycling Program” has already taken start officially by Apple. The program takes place in Apple Stores, either on the floor or at the Genius Bar and the specially trained Apple employees are ready to conduct the trade-in process via the mobile EasyPay devices. The training program covered multiple generations of iPhones and the customers are now able to bring in an iPhone 3G, iPhone 3GS, iPhone 4, iPhone 4S, and iPhone 5, and receive a gift card to be applied to a new iPhone purchase! As for the gift card value estimation, it depends on the overall condition of the device being traded in. While trade-in values will change over time, it appears that a 16GB iPhone 5 in good condition has a trade-in value of around $250. However the new iPhone must be purchased during the trade-in process, and the new device will be activated on a contract. As iMore comments, “ this trade-in program is part of Tim Cook's strategy of getting more customers to buy iPhones directly from Apple. When phones are sold by carriers, as is most often the case, Apple is at a disadvantage. The iPhone is presented as just another smartphone, one of many. 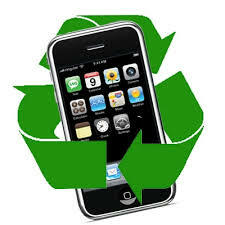 The traded-in iPhone will be packaged in a plastic bag and shipped to BrightStar for recycling in the United States.